It’s no secret that consumers are social beings, so why should patients be treated any differently? Research has found that the average American goes to the doctor three times during the course of a year, but spends 52 hours online searching for health information. It’s not just from a computer either; 52 percent of smartphone users have looked up health or medical information from their mobile devices.1 Americans want answers fast and head straight to online news outlets, social media channels, blogs, Wikipedia, pharmaceutical company websites, and everything in between. Why have so few pharmaceutical companies broken through using social media? Clearly companies remain concerned about running afoul of FDA regulators, and for that reason have not yet fully embraced new channels. When the FDA released long-awaited guidelines about the communication of health information via social media, it took a fairly restrictive stance, requiring that companies communicate information about risks and benefits in any social media message. 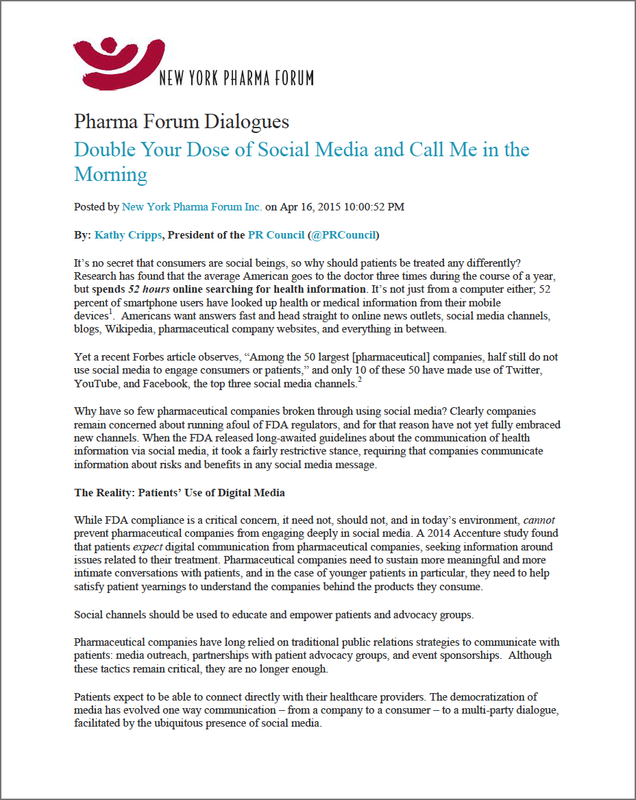 While FDA compliance is a critical concern, it need not, should not, and in today’s environment, cannot prevent pharmaceutical companies from engaging deeply in social media. A 2014 Accenture study found that patients expect digital communication from pharmaceutical companies, seeking information around issues related to their treatment. Pharmaceutical companies need to sustain more meaningful and more intimate conversations with patients, and in the case of younger patients in particular, they need to help satisfy patient yearnings to understand the companies behind the products they consume. Social channels should be used to educate and empower patients and advocacy groups. Pharmaceutical companies have long relied on traditional public relations strategies to communicate with patients: media outreach, partnerships with patient advocacy groups, and event sponsorships. Although these tactics remain critical, they are no longer enough. 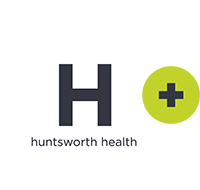 Patients expect to be able to connect directly with their healthcare providers. The democratization of media has evolved one way communication – from a company to a consumer – to a multi-party dialogue, facilitated by the ubiquitous presence of social media. These relationship-building initiatives go beyond just using social channels to deliver a company or brand message. They create a channel for dialogue. “Our clients are constantly receiving consumer insights from patients/bloggers as well as offering these patient communicators valuable resources and access to people they may not have on their own,” continues Royle. With the challenge of frequent misdiagnosis and lack of awareness about Cushing’s disease in Latin America, Newlink Communications designed a program driven by paid-for, non-branded tactics on social networks to identify Cushing’s disease patients, or individuals with any factual or possible ties to the disease. The plan combined the use of Facebook ads to micro-target specific audiences; it also measured participants’ desire to learn more about the disease, and willingness to become part of a Facebook support group. The strategy proved a great success as it was able to identify 47 confirmed patients and more than 1,000 people connected to or interested in this rare disease that is estimated to affect two or fewer per 100,000 people. Companies seeking to wade into social more deeply can start by analyzing how their existing social media presence stacks up against that of their closest competitors. Then they must identify and understand their target audiences to determine the optimal social strategy. Burson Marsteller’s communications team discovered that community played a greater role than was previously thought in a sample of chronic disease patients. Their research found that 93 percent of advocacy community members used the internet for health information and disease management, while 71 percent of patients were actively engaged on social media. With online community support, patients with this condition felt empowered to care for themselves more energetically. This and other insights led to an effective patient engagement program that built a community and enhanced awareness around the disease. To excel at social media, pharmaceutical companies should create meaningful and relatable content that can be shared and cited. They should drive discussion and dialogue [while always complying with government regulations]. They should provide targeted, channel-specific messaging to various audience segments. And they should use visual communications — for instance, video and infographics — wherever possible. One successful campaign, Parkinson’s More Than Motion, is an interactive Facebook community campaign developed by Cooney Waters and its client UCB to reach people with Parkinson’s disease and their caregivers. This reality-style video and interactive content-rich series, now in its third year, informs patients about the importance of recognizing and treating both the motor and non-motor symptoms of Parkinson’s disease. More than 75,000 fans have watched these videos. Educational tools and ongoing content and communications keep them actively engaged and coming back for more. In some sense, the communications challenges posed by social media are not new. The discipline of public relations has always focused on communicating messages through earned trust (such as articles written by journalists) rather than paid messages. Likewise, the imperative to sustain honest, authentic conversations with consumers has always existed, irrespective of regulations. New social media technologies simply allow interactions to happen more fluidly and dynamically. Don’t let fear of the unknown prevent you from meeting today’s patients where they are. They’re out there, waiting for a conversation. Are you up to the challenge? Kathy Cripps is president of the PR Council (@PRCouncil), a U.S.-based trade association with over 100 member firms. Kathy is a former president of a healthcare PR firm; she also was US healthcare director of a global multinational firm. She has also been a guest speaker at New York Pharma Forum. For more information on the PR Council, please visit www.prfirms.org.